It was asked more than a year ago and apparently it got protected today. What is the best practice adopted in EL&U for closing questions that are more than a year old? Is there any tangible benefits for closing questions that are too old (to migrate) citing any of the close-vote reasons? All questions, even old ones, provide examples to new users about what we think is acceptable on the site. If a question does not meet our standards, it may be closed regardless of how old it is. With this in mind, we might want to peruse some of the oldest questions in the Frequent tab and bring them up to our current standards or mark them with a historical flag. 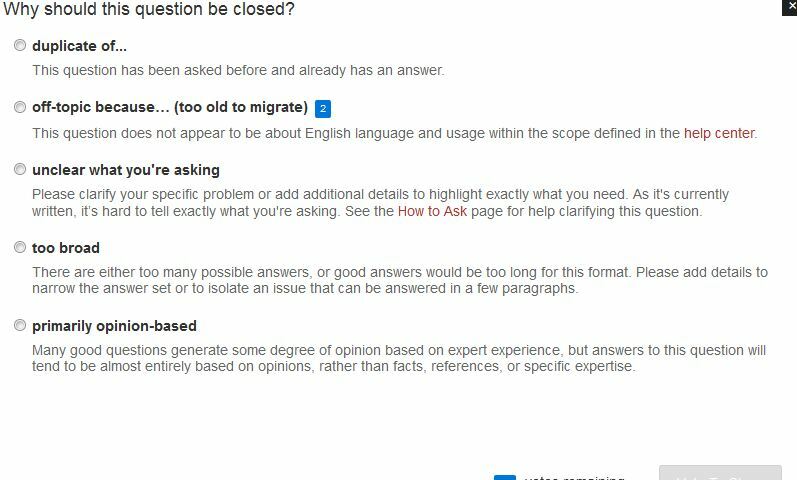 Close the older off-topic questions as a means to discourage low quality answers; protect any question that is older than 12 months to prevent new users from making any contribution; stick a historical flag so no one can post a new answer nor express their approval on the question, or cast a vote on any of its answers. Anything, but anything is better than deleting them, as recommended by one member. @sumelic Thanks. As far as I understand, English Language and Usage Meta is to discuss workings and policies of this site and that's why votes don't affect your reputation points. I will write a post that includes the list of all worthless crap that should be closed and deleted when I have time. It is high time we did that. – How can users nominate old, popular questions for exemption from closure as being of 'historical value'? I am not proposing to close and delete all of them at once. The poster asked a question and I expressed my opinion. I think it is a good thing to close old questions and delete them even if they are more than a year old. Madness. Sheer folly. The idea of possibly deleting three or four years' worth of database because hundreds of questions asked in 2010/11/12 do not conform to today's guidelines, is pure folly. It was those old questions that first attracted me here in the first place. I looked up a question, and the answers on that question spurred me to read another post, and another, and yet another until I was hooked. Back in May 2013 my Italian private student wrote: “... our body's health...” I wasn't sure about the spelling, should it have been “..our bodies' health...”? I Googled, and EL&U popped up, the rest is history as they say. If that question had been deleted (because it lacked research) I would never have come across this website. I was a rookie then, a baby, a newcomer, and I was fascinated by the answers that had been posted. I was literally in awe. Recently, a high rep user has suggested that old questions which are clearly off topic should be deleted because they are "worthless crap". They do not conform to the updated site's policies. Not today they don't, but they did between 2010 and 2013. Why the need to penalize users who followed the rules back between 2010 and 2013? It's like bulldozing a 19th century English country cottage because it was built following yesteryear's building regulations and norms. Is that fair? The site's regulations, and guidelines are modified almost on a yearly basis, it is therefore quite probable that there are going to be questions which are on topic today which will no longer be in four or five years time. Questions that may seem banal and irrelevant to future users, but which at the time was a source of interest and intrigue. If the community deletes five-year-old questions today, it means questions that were submitted in 2015 could be deleted in the future. From an egotistical viewpoint; where is the guarantee that my contributions are safe from deletion? Do I like every question that has been posted? Do I think every question must be saved for prosperity? No, of course not, but if a post older than 12 months earned a couple of thousand views, generated one or more answers which attracted upvotes then it means someone, somewhere, found that question or its answers useful. Should we endorse deleting that post because it fails to conform with the present-day guidelines? There are other avenues, one of these is to close that question with the approval of five users. If this needs to be said, closing a question is not equivalent to deleting it. WTH is up with the 'beyond 300' review queue?